Photographing smoke is not easy. There are many people who try abstract smoke photography and get OK results, but to get the smoke to be perfectly focused is hard. The rising smoke, especially when turbulent, moves very quickly and it is difficult to focus on it even with modern AF DSLRs. It helps to increase the depth of field which in turn requires lots of light (flash) and in turn makes it impossible to just shoot several frames a second as the flash system takes a while to recycle. I am a purist when it comes to photography, so I do not modify my images in photoshop or any other image editing tool. My abstract smoke photography does contain images of smoke creatures which were mirrorred in photoshop, but all the original image is as shot straight out of the camera. I wanted to take some smoke images with my medium format camera because it has incredible detail. The auto focus on that camera is very slow in comparison to my DSLR, so I ended up having to focus manually, a very frustrating task when photographing smoke. I did end up with a few images that were very sharp. One of them was perfect out of the box. 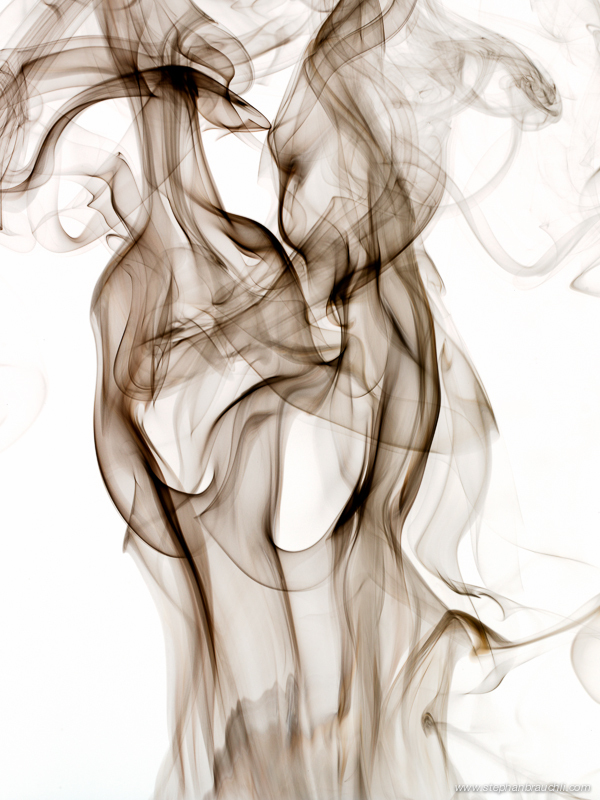 To me the shape of the smoke resembles two people dancing tango. The woman is quartering towards the viewer and may be wearing a hat or an interesting hair style. The man is dancing close to her quartering away from the viewer. As usual with my images nothing was modified. This image “The dancers – can you hear the music?” received an honorable mention award in Fine Art at the International Photography Awards in 2012.